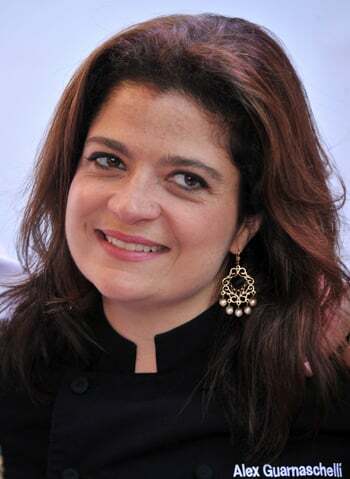 Between Alex's Day Off, her two restaurants, and a column on Food Network, star chef and restaurateur Alex Guarnaschelli has her hands pretty full. Still, she's somehow made room to compete in the forthcoming star-studded season of Next Iron Chef, which premieres this Sunday, Oct. 30. 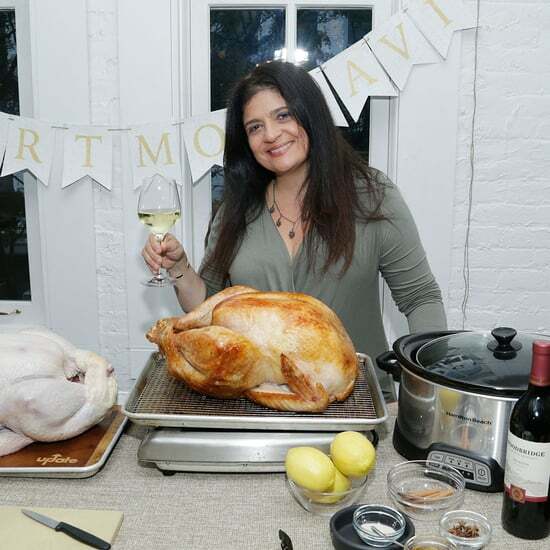 We caught up with her at the New York City Wine & Food Festival to get her thoughts on competing under pressure, making new celebrity chef friends, and the show's most emotional moments. YumSugar: What was it like competing in Next Iron Chef: Super Chefs? 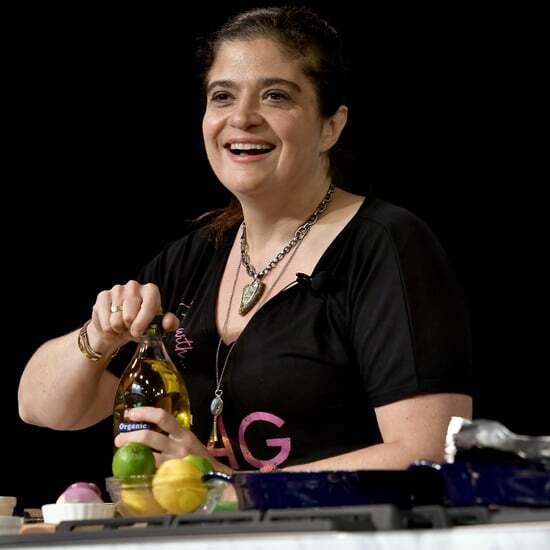 Alex Guarnaschelli: It was like going to sleep-away camp and being 18 again, in a way. You're removed from your normal life, in an abyss, with a knife and chunks of meat. It was an interesting experience. I made some friends that I didn't expect to make, like this one. [Michael Chiarello walks up]. AG: I'd never met Michael Chiarello, as an example. I thought, "Wow, he's a tough cookie — I don't know about that one," but then we wound up in tears, laughing so hard, so many times. He would just give me that little look and a little flick of the eye, that little Clint Eastwood facial expression and it just kind of reboots you. It reminded me how alive we are. I don't know if that's good. It's kind of like being whipped with a thunderbolt. Read on to hear more of Alex's takeaways from Next Iron Chef: Super Chefs. YS: Did you feel like there was a lot of ego involved? AG: No, very little ego. I mean, tremendous arrogance, because you're driven and you're trying to win something, and it's you alone in the abyss. But no, as far as the other contestants, not at all. We knew better than to play that card at all. We really wanted to let the cooking, and the relationships, and the pressure speak for itself. There's enough characters in the play. We don't need to have a sword fight over who gets to cook more. YS: Who did you consider to be your biggest competitor? AG: My biggest competitor is me. It's the psychology of the game, it really is. I was looking forward to being with two other women who are really great chefs. I wanted the women to really excel this year. So I definitely excluded them from my competitiveness in the game. It's all the dudes — they gotta go. YS: What was the takeaway? Did the experience make you a better chef? AG: Totally. I learned a lot about cooking, I learned a lot about myself, I learned a lot about what works and what doesn't work. You learn lessons in hard ways. When you cook for many years and you crave learning and new experiences, this is certainly one way to get it. Quite painful, but it's one way to get it. YS: Was it an emotional experience? AG: The emotion is tremendous. It is a tremendous component in this competition. You really put yourself out there, you're making who you are vulnerable at the highest level. It's hard. But you know that going in. YS: What was one of your most emotional moments on the show? AG: I think the very first competition, the very first frame, the very first moment when you say, "I can't leave now; I cannot grab my bag and head to the airport like a bat out of hell." You say yes, you go there, you joke, and whatever else, and then the camera starts rolling, and you look out in front of you, and you want to put on your ruby slippers, click your heels, and wind up in your living room with a can of soda and a junky TV show, but it's not going to happen. YS: Did the outcome of the show surprise you? AG: I didn't have any expectations when it got to the outcome. It's like a mountain that you climb in pieces and you don't ever look at the top. You just try to get up, up, up, up every day, honestly. So anything is going to be a surprise to me, because that wasn't how I looked at it, that wasn't my approach. It may have been different for other competitors, but for me, it was incrementally in pieces. YS: What's next with you? 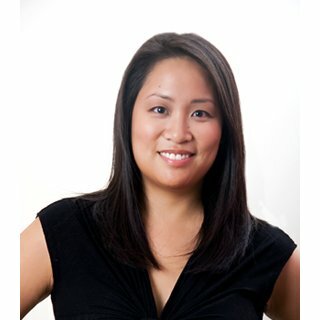 AG: The Darby, my restaurant on 14th Street, has been open for a year, and it's getting to where I actually really love it. It's a unique dining experience, with the band and everything else; it's really kind of neat. So I'm just working on refining that. I'm not a big fan of doing too much too quickly. 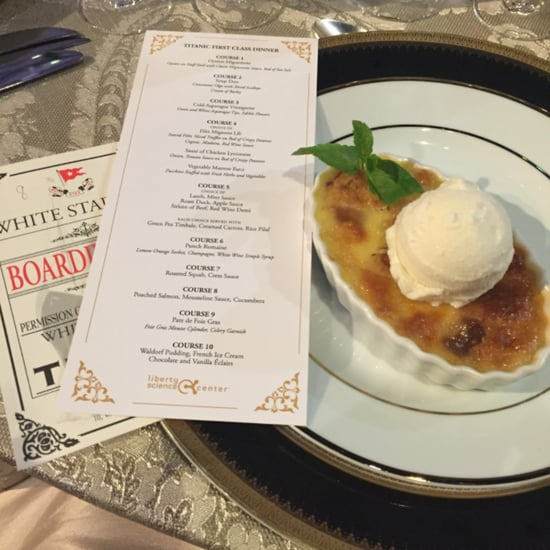 I Ate the Last Dinner Served on the Titanic. Feast Your Eyes . . .